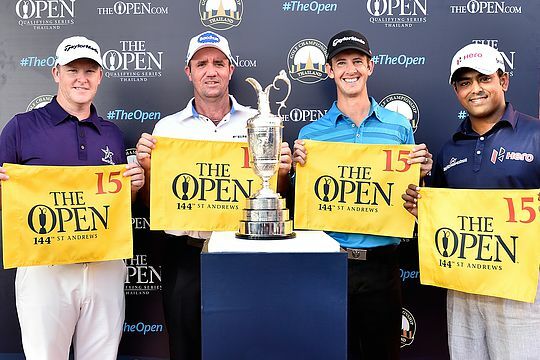 The Australian contingent at The Open Championship at St Andrews in 2015 was already taking on healthy proportions but Marcus Fraser and Scott Hend have taken it up a notch, after earning two of the four qualifying spots on offer following their high finishes at last week’s Thailand Golf Championship. Fraser led the chase for the four qualifying places on offer at Amata Spring Country Club with a steady performance from start to finish. The 36-year-old fell just short of a second Asian Tour victory after narrowly missing his putt on the 18th to force a play-off with winner Lee Westwood, finishing tied second with U.S. Open champion Martin Kaymer. The two-time European Tour winner will now make his return to St Andrews ten years after making his Major Championship debut there in 2005. It will be his fifth appearance at The Open, and his best finish to date was tied 35th at Royal Liverpool in 2006. “I played in The Open at St Andrews in 2005 as the first Major I ever played. I was jumping out of my skin on the first tee but hopefully I’ll be calmer next year.” said Fraser. Hend also played The Open at St Andrews in 2005 and will make his second appearance in 2015. The six-time Asian Tour winner carded a 69 on Sunday to finish in fifth place on four-under-par. He won the Hong Kong Open in October to earn his European Tour card for next season. “Today I was thinking more about the four spots in The Open [than winning]. It created a bit more pressure because I really wanted desperately to play in another Open. 2005 at St Andrews was my one and only Open and I’m really excited to have a crack at it again.” Hend said. Just two weeks ago at the Emirates Australian Open, Rod Pampling, Greg Chalmers and Brett Rumford booked their places at The Open and with the addition of Fraser and Hend, at least nine Australians – Adam Scott, Jason Day, John Senden, Geoff Ogilvy, Pampling, Chalmers, Rumford, Fraser and Hend – are now assured a start, with many more qualifying events still to play around the world next year.